Use the following VBA code to create a contact picker to link contacts to tasks. You can change the code to allow for a manual pick of contacts folder, ie not hardcoded. If you have contacts stored in another folder, this change will make it easier to use. I would like to link my contacts with their emails and see the emails within contact's form. (I use a custom form for my contacts, called: "0A-Contacts-text", which is stored into:"outlook:\\ΕΠΑΦΕΣ 1 ΦΕΒ 2015\*0 ΕΠΑΦΕΣ-new ALL.)". In this form i have put a nickname for each one contact, which matches with a custom field named: "PERSON" in each one email, into the folder: "outlook:\\**007-LIVESTOCK-final\*NEW-all in one folder"
If you use 2010 or up, enabling the people pane might be easier - it will show mssages to/from the contact in a small pane at the bottom of the contact, similar to the old Activites feature. Otherwise, you need to use find or restrict to look them up. 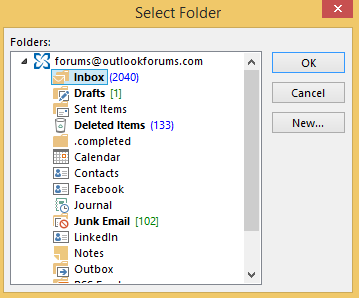 The old Outlook view control might work too. Due to the problems with Links in 2013 will this solution work in office 2013? I haven't tested it yet, but I am assuming that it won't.